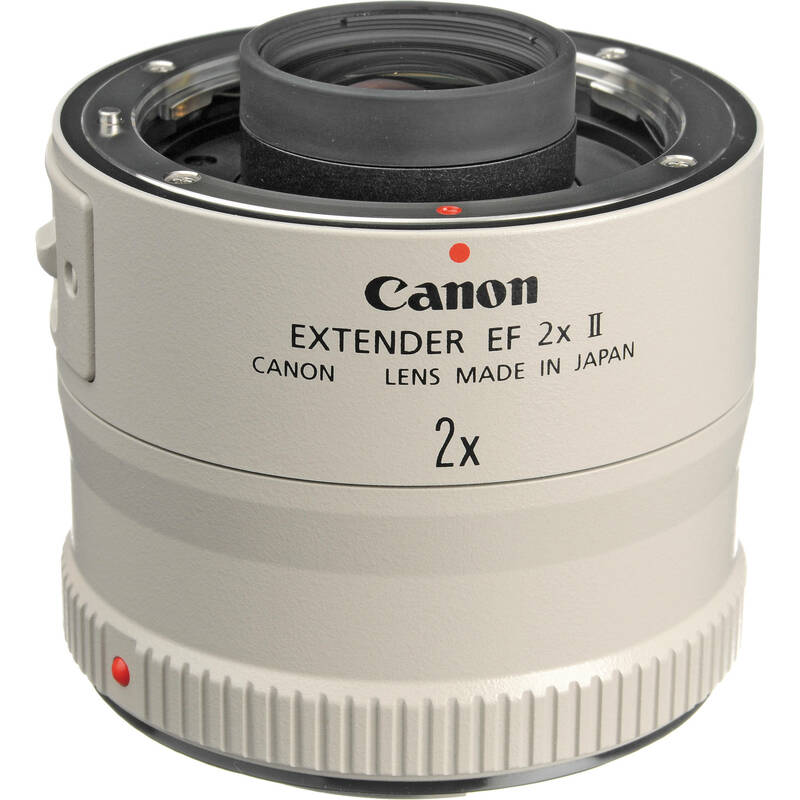 The Canon EF 2x II Extender is a high-quality teleconverter that preserves the image quality of the lens it's mounted to and multiplies its focal length by 2x. When combined with pro level EOS cameras & EF supertelephoto lenses with image stabilization, near imperviousness to weather extremes is achieved thanks to rubber gasket seals. Improved antireflective internal coatings also increase transmissivity & performance in backlit conditions. The 2x extender (also known as a teleconverter) will multiply the focal length of the existing lens by 2x, and will cut back the amount of light by 2 f/stops. For example, using a 2x teleconverter with a 300mm lens will effectively increase the focal length to 600mm. A lens set to f/2.8 will now be f/5.6. Teleconverters are best used with longer telephoto lenses and are not recommended for lenses wider than 50mm, e.g. 28-105mm (35mm format). Note: This teleconverter will only fit and work with a select list of lenses. Please click here for a compatibility chart of all compatible lenses. Note: Autofocus is possible with any EOS body if the lens has an f/2.8 or faster maximum aperture, and compatible Image Stabilization lenses maintain the IS feature when used with any current EOS camera. Box Dimensions (LxWxH) 5.4 x 3.7 x 3.6"
2x EF Extender II (Teleconverter) is rated 4.4 out of 5 by 297. Rated 4 out of 5 by me from Good, but not perfect (300mm f2.8L IS) Purchased for my 300mm f2.8 IS, which is argueably Canons sharpest lens (along with the new 200mm L). I already own the 1.4x tele and though I would give the 2x a try. While the results are good, they are not up a pro or even a serious photography enthusiasist standards. Image deterioration is visible mostly only upon enlarging over 100%. If your not enlarging, picture performance is actually acceptable. The 1.4x tele has much better results in my opinion. So this is a very good, inexpensive way to increase your reach, but not perfect...not that I expected it to be perfect for the price...im realistic. Rated 5 out of 5 by Robphoton from Excellent optics, but use it correctly I use it with the EOS 40D & EF 100-400 L IS and can resolve the legs of insects walking on the siding of my house at 150 ft hand held (this is about 1 pixel resolution on this 10 MP sensor so you can't do much better than this! ), but f stop can not be wider than 18 or you will get lens flare that degrades the image. With IS the fastest shutter speed is 1/800 for hand held, otherwise move to tripod with IS turned off. Shooting in manual mode seems best. IS works fine but AF does not work on this 1.6 image sensor camera. I also own the excellent 1.4 EF Extender II. The corresponding hand held dim light limits are f14, 1/640. Again IS works fine but AF does not. Rated 4 out of 5 by Jultsu from Not perfect, but.. Bought this one along with Canon EF 200mm f/2.8 L. They give a nice 400mm f/5.6, add that to a 1.6x body and you get a whopping 640mm! The image quality does indeed suffer when blasting away with full aperture, but stopping down to f/8 helps a lot. At f/8 sharpness is somewhat ok, some CA is also present. The bokeh is the worst part about this TC. It's not god awful, but still ugly (compared to the 200mm by itself.) I recommend you use this ONLY with SHARP lenses that are f/2.8 or faster, since they autofocus (although slowly) with the non-pro bodies also. 135/2, 200/2.8 and 300/2.8 are the prime candidates for this TC. If your lens isn't tack sharp to begin with, forget this and get the 1.4x TC. Rated 4 out of 5 by Anonymous from Good needs more work. Got this when I purchase the 1.4x and 2x together. Wanted extra reach with my large lenses. Read the reviews of what others were saying thought I would give it a try. On my 70-200 f2.8L is, works with autofocus on a xt body. Now on a 70-200 f4 there is no autofocus on a xt or xti. If you want autofocus with this you either get fast glass f2.8 or a pro body higher than a xti. Now it does soften the image very slightly, very hard to notice, you have to shoot without and then shoot with to compare to see the different. When combined with the 1.4x same findings. I think if canon could improve this like the 1.4x, some very small tweaks, they would have a unique setup. Rated 4 out of 5 by Tarobot from Nice, but not perfect I purchased the 2x EF Extender to use mainly with my Canon 70-200mm f2.8L IS USM lens. It gives me the extra reach I need when shooting sporting events and for getting close to animals in nature without disturbing them. There is a slight drop in image quality when using the extender as opposed to without, but still quite good. I probably would not shoot stock photography with it, but it is more than adequate for most uses. The autofocus does work with my 70-200mm lens. The build quality is top notch and of L lens quality. I hear that the 1.4x extender is much more sharp, but I really needed the 2x reach. I am happy with my purchase. Rated 5 out of 5 by Mike from must have A small light weight extender. If it fits the lens, you can double the focal length for a fraction of the cost and weight of a lens. The quality of the image suffers slightly if you make medium to large prints, but I have the image taken with twice the focal length:( 1200mm, 800mm, 400) need I say more? I take the two stops into consideration(use a tripod,up the iso...ect). If absolute quality is a must I use a larger format and use my best lenses(5DII,70-200 II) so for carring around a reasonably small system I get very wide angle to fairly long lens with this 2X teleconverter on my 70-200 II and a couple of other lenses with a 7D. Rated 4 out of 5 by Inkboy from A useful piece of kit, but has limits I've used the 2x extender on my EF 70-200 f/2.8L IS USM with a 40D for wildlife and aviation shots. Auto focusing is noteably slower than without (as expected), and at full zoom and wide open (400mm f/5.6 effectively) there is a marked loss in sharpness. At lower zoom and/or with more light the results are increasingly better. Until the day I can get a long telephoto, it's nice to be able to go to 400mm with this little item in my kit, especially if light conditions are good. But one cannot expect to stretch the superb 70-200 f/2.8L two times and keep the same excellent sharpness.